February 24, 2019 Andrew Collins Trio – Rescheduled! This concert is being rescheduled to to circumstances beyond our control. Please stay posted for more news. Mando maestro Andrew Collins finds himself – through no actual fault of his own – at the epicentre of Canada’s burgeoning acoustic/roots music scene. He didn’t invent it – but he’s certainly been a contributor, having co-founded seriously noteworthy Canadian bands like the Creaking Tree String Quartet, the Foggy Hogtown Boys and, more recently, his namesake Andrew Collins Trio. 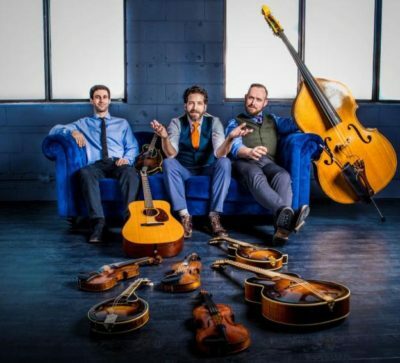 That’s not to mention the fact that this prolific, robust performer – comfortable on mandolin, fiddle, guitar, mandola and mandocello – composes, produces, arranges, writes and teaches across multiple genres, including a popular collision of folk, jazz, bluegrass, celtic, and classical. They just released a new double album, grafting 11 vocal cuts (tongues) to 11 instrumentals (grooves) to create a seamless finish with their cleverly monikered double album, Tongue & Groove. Each cut is milled to perfection and represents a back-to-basics visitation on what the band does best — spontaneity of the stage and rapid-fire, improvisational exchanges.